What comic books did you read as a kid? Not Batman. There was Superman, and growing up I wanted to be Superboy. I have pictures of myself that my mom took when I was 3 years old, riding around on my tricycle with a cape, which wasn’t really a cape—it was a bath towel with a clothespin holding it together. 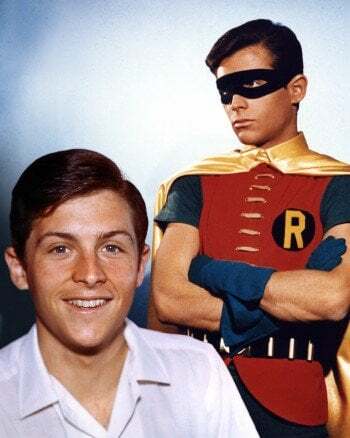 I believe sometimes that thoughts are things, because I just thought about it [being a superhero] all the time, and here I grew up to play Robin. How did you get the part of the Boy Wonder? What did you think about wearing the costume? It was the most horrendous experience of my life. I called my tights my python pants, because they nearly strangled me to death. What else didn’t you like about being on Batman? All the explosions and the danger, having to go to the emergency hospital so much. I had never been to an emergency hospital in my life until Batman. Put it this way: You’re tied down to a table, you know there’s an explosion coming, your hands are tied to your sides, and you have no way to protect your face. The special-effects guys setting the charges—this is 8 o’clock in the morning—as they walk past you, you smell liquor on their breath. That’s a bad sign. You did your own stunts? Is it true you could’ve had the lead in The Graduate? When I was doing Batman, I met Larry Turman, who was the producer of The Graduate. This was a film that was being done at 20th Century Fox, the same studio. He came to me and said, “I have a small film, and I’d like you to do the lead.” But the studio, because Batman was so enormous and successful—it was the biggest show in the world—they didn’t want to dilute anything to do with the character by having me play a different role. The studio wouldn’t let me do it. So when they couldn’t get me, they went out and found Dustin Hoffman. What is the most common question people ask you at events like Awesome Con? What else do they ask you about? What do you do with the proceeds from your autograph signings? In 1994 my wife and I started Gentle Giants, and we’ve since become the largest giant-breed dog-rescue organization in the world. We’ve rescued more than 15,000 dogs in the past 20 years. We take them in, rehabilitate them, train then, get them healthy, and then adopt them out. Right now I have about 45 to 50 dogs in my house. All the money from signing autographs is donated to feeding our dogs. When you feed 600 pounds of food a day for 20 years, it’s an expensive proposition. But all these dogs ultimately find safe, loving homes. Because he wags his tail instead of his tongue.